Tenta DNS is your open source, privacy-first DNS solution that supports DNS over TLS and DNSSEC for a safer and more reliable internet. DNS or domain name system is described as the backbone of the internet since it controls your domain's website and email settings. DNS maintains the directory of internet domain names and translates them into internet protocol (IP) addresses and vice versa. In other words, when you type in a website address, it's the DNS that's responsible for making sure you connect to the right servers and load the correct website. Learn more about DNS on our blog. Switch to Tenta DNS for a safer, privacy-first internet. Stop ISPs from spying on your browser history. DNS-over-TLS adds a layer of encryption over your DNS requests, keeping your ISP from seeing which websites you visit. Browse .bit domains. Tenta DNS supports OpenNIC roots, allowing you to access .bit domains without additional extensions or plugins. That means you can also load domains such as .bit, .bbs, .chan, .dyn, .fur, .geek, .gopher, .indy, .libre, .neo, .null, .o, .oss, .oz, .parody and .pirate domains. Stay private online. Tenta DNS logs a counter instead of queries so your data stays private. No one, not even Tenta, has access to your browsing data. Thanks for choosing Tenta DNS! Built from the ground up with privacy in mind, Tenta DNS supports DNS-over-TLS, DNSSEC, and ICANN and OpenNIC roots. As a result, this modern DNS alternative can resolve unique domains such as .bit, and can be run as either a recursor or authoritative server. If you're experiencing any problems, please let us know. If you're not sure which nameserver to choose then we recommend starting with OpenNIC. The main difference to consider here is that with OpenNIC you gain access to special TLDS, such as .bit domains. When it comes to speed and performance, the answer is a bit more complicated. OpenNIC is an alternative DNS network owned and controlled by the users. They've earned a reputation for protecting online privacy with a mission to keep the internet free from censorship. Hence they peer with many different alternative DNS Roots such as Namecoin, Emercoin and New Nations, but are alot smaller than ICANN overall. ICANN is the non-profit organization that's in charge of handing out all the domain names for the entire internet. They obviously have more funding for maintenance than OpenNIC, so this may result in ICANN nameservers being more robust for you. Having said that, switching to Tenta DNS with either option protects your online privacy, but we share OpenNIC's mission and recommend trying it first. Tenta Gopher: Golang + Tenta for Secure DNS! 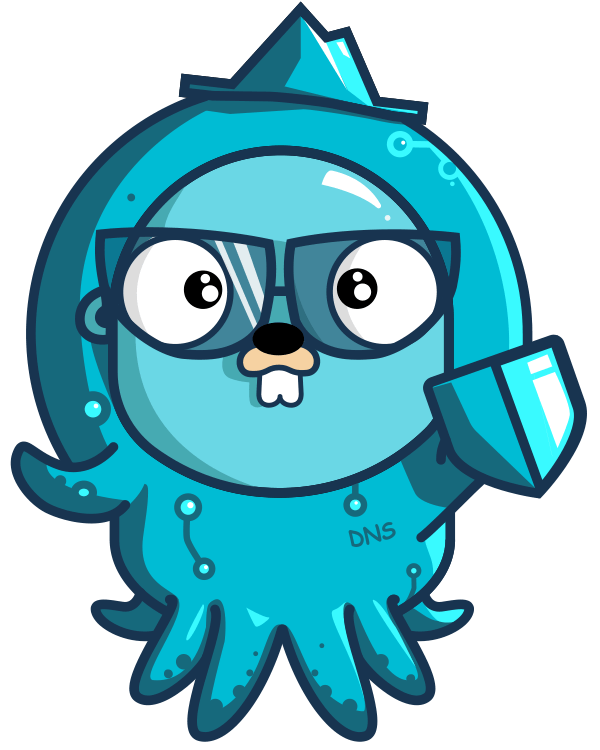 Tenta DNS is a privacy-first DNS alternative developed in the modern language, Golang. This open source project is available on Github. Tenta DNS provides a DNS server suite comprising an authoritative DNS server, recursive DNS server, and NSnitch, which provides a DNS server capable of recording the IP address of requests made against it and then makes that IP available via a JSON API. We welcome contributions, open to partnerships, feedback and plain old complaining. Feel free to open an issue or shoot us a message to [email protected] If you'd like to contribute, please open a pull request and send us an email to sign a contributor agreement.